“It could very well be a reference to Jesus Christ, in that he was once the primary exponent of white magic,” Goddio, co-founder of the Oxford Center of Maritime Archaeology, said. He and his colleagues found the object during an excavation of the underwater ruins of Alexandria’s ancient great harbor. The Egyptian site also includes the now submerged island of Antirhodos, where Cleopatra’s palace may have been located. Both Goddio and Egyptologist David Fabre, a member of the European Institute of Submarine Archaeology, think a “magus” could have practiced fortune telling rituals using the bowl. The Book of Matthew refers to “wisemen,” or Magi, believed to have been prevalent in the ancient world. He added that the individual, or “medium,” then goes into a hallucinatory trance when studying the oil in the cup. 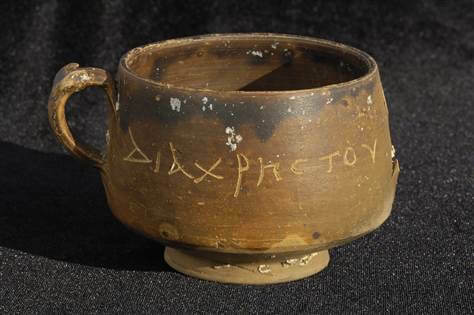 The magus might then have used the engraving on the bowl to legitimize his supernatural powers by invoking the name of Christ, the scientists theorize. Weird science: Top unexplained mysteries Goddio said, “It is very probable that in Alexandria they were aware of the existence of Jesus” and of his associated legendary miracles, such as transforming water into wine, multiplying loaves of bread, conducting miraculous health cures, and the story of the resurrection itself. While not discounting the Jesus Christ interpretation, other researchers have offered different possible interpretations for the engraving, which was made on the thin-walled ceramic bowl after it was fired, since slip was removed during the process.